This past week, I’ve had two great coaching appointments that were part of the bonus with the order book on Greeters (Click on image to get yours from Amazon). I’ve put together this ebook aimed at those who don’t want to reinvent the wheel while trying to figure out where to start with renewing or updating their greeter ministry. “I’ve read through your ebook, and it has my mind is swirling with ideas. There is so much to talk to our greeters and ushers about at our meeting on later this month!!!! Your ebook is now full of my Pink and Yellow Highlights with all the ideas I could use. You’ve given me some great thoughts about what steps I need to take. Taking on organizing this ministry doesn’t seem so overwhelming anymore. The follow-up phone call we had helped me discover some practical steps I could immediately take to fire up the ministry in our 400 member church. 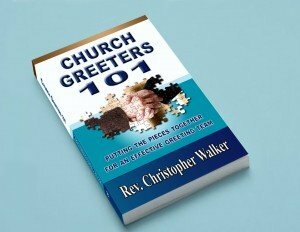 Click on the banner below to order and download your copy of Church Greeters 101. This graphic has an old cover from a prior version. If you purchase the book, you may claim free coaching appointment with me to discuss how to improve your greeter ministry. Hi….My name is Stephanie Harris, And we are having Men and Women day program. And I have to do a welcome for the program. can u please provide me with some suggests. I wanted to say somethig with spelling out the word welcome.